$1.1 Trillion Fund Is Buying Everything With Fed At "Market's Mercy"
I have one final point, which is to ask, what is the plan if the economy does not cooperate? We are at $4 trillion in expectation now. That is where the balance sheet stops in expectation now. If we have two bad employment reports, the markets are going to move that number way out. We’re headed for $5 trillion, as others have mentioned. And the idea that President Kocherlakota said and Governor Duke echoed— that we ’re now a captive of the market — is somewhat chilling to me. The idea may have been chilling, but unfortunately for the Fed, it's absolutely accurate, and it's a fact which traders once again confirmed earlier this year when after the S&P's near bear market tumble, Powell caved and reversed his formerly hawkish stance. The Fed's inability to oppose the market is also the only investing thesis one needs for this year, according to a $1.1 trillion fund manager, who claims that the path to outperformance in 2019 is "as simple as betting the Federal Reserve will temper its tightening plan" and do the bull market’s bidding. Expecting even more dovishness outof the Fed, the fund is buying up virtually all risk assets (with the exception of Europe, where the ECB remains in a tightening phase). Echoing what Jerome Powell first realized in March 2013, Wouter Sturkenboom, Northern Trust Asset Management’s Amsterdam-based chief investment strategist for Europe and Asia said that the Fed is "at the mercy of the markets" and "that’s why we have re-instigated a risk position" across stocks in the U.S. and emerging markets at the expense of investment-grade bonds. Naturally, the firm which oversees $1.1 trillion in total assets, sees clear sailing for the rally for now. What would give Nothern Trust second thoughts about its rather simplistic, if accurate, investing strategy? The fund is keeping a close eye on on the 5Y Treasury yield, which would need to rise “meaningfully” to give the central bank the green light to push ahead with its indicative tightening plan, according to Sturkenboom. Meanwhile, $300 billion asset manager Neuberger Berman is investing along the same broad lines: the firm is adding equities and bonds of developing nations while cutting cash and government debt, according to Erik Knutzen, CIO of multi-asset strategies. In other words, a repeat of what happened exactly one year ago when everyone was dumping safe haven assets and cash, and rushing into risk assets. However, unlike Nothern Trust, the fund's core thesis is that the dollar's decline is to accelerate: "We really just need it not to appreciate for our view to hold,” said Knutzen. “If the Fed is pausing, if inflation is moderate, then a lot of the hugely wide rate differentials and spread differentials between the U.S. and the rest of the world will start to ease." There is another difference between the two funds: as Bloomberg reports, after violent swings in the "America First" trade last year, Neuberger’s top macro call is the tentative re-convergence for the rest of the world, helped by liquidity and signs of progress in U.S.-China trade talks. 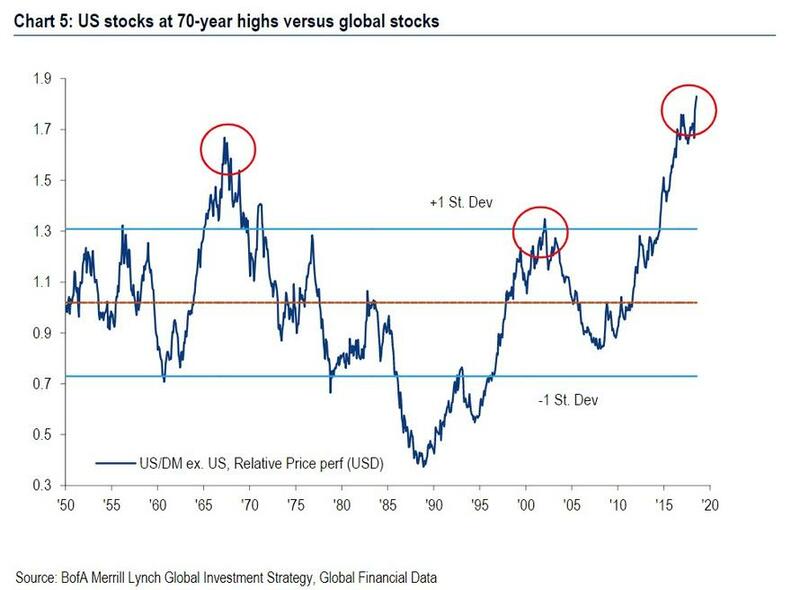 Indeed, a recent chart from Bank of America shows that the US has never been more overvalued relative to the rest of the world. As a result, over the past week, the firm took profits on American equities as the asset class notched the best start to a year since 1987. Yet while both agree that with or without the US, emerging markets are set to shine, Europe could be one big loser in all this. Between Brexit and populism in the euro area to shifts in leadership in Germany and the European Central Bank, the region is plagued by economic and political risk. That’s prompting both Neuberger and Northern Trust to look elsewhere for returns. “We are going to need greater conviction in the growth outlook to increase exposure to European stocks,” according to Sturkenboom.